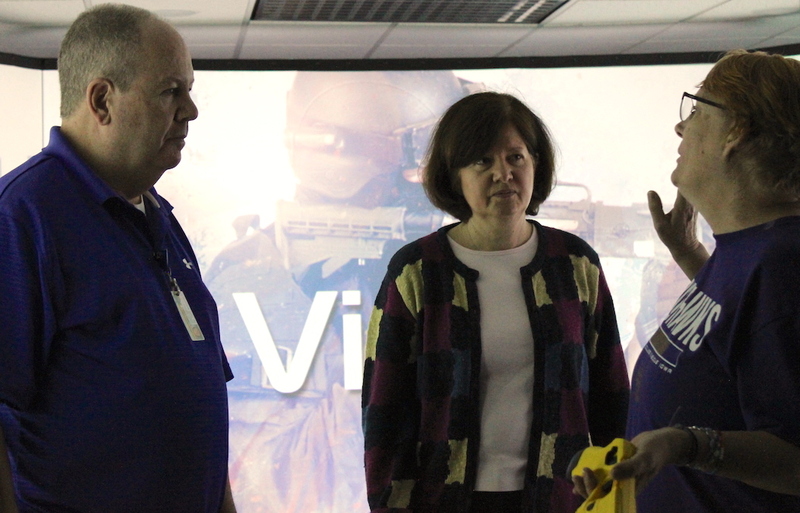 Donna Heald (left), vice president of academic affairs at Loras College and Valerie Bell, associate professor of criminal justice, react to a virtual scenario during a demonstration. DUBUQUE, Iowa – Loras College, a Catholic liberal arts higher education institution, in partnership with Northeast Iowa Community College and the Dubuque County Sherriff’s Office, will employ the “Judgmental Use of Force Simulator” in its new class beginning this fall. The new hands-on course features the only four-dimensional training system in the state of Iowa. Control panels allow administrators to monitor the VirTra 300 Law Enforcement Judgmental Use of Force Simulator. The VirTra 300 Law Enforcement Judgmental Use of Force Simulator, housed inside the NICC Town Clock Business Center in downtown Dubuque, immerses users with a wireless, interactive 300-degree experience via five 8×10-foot screens, directional audio and a platform that rumbles underfoot, adding the sense of touch to the sight and sound events. Initially, 16 students will be selected to participate in the simulator training. Bell, along with law enforcement officials, will work together to choose from 180 scenarios appropriate for them. “We expect different things from our officers and the decisions they make compared to someone who isn’t trained,” said Sgt. Dave Boardman, training coordinator for the Sheriff’s Office. The simulator uses laser technology via a full range of law enforcement weaponry fitted with laser emitters. A carbon dioxide charge operates the action of the weapon, providing an accurate feel for trainees. Sensors behind the screens detect the shots, and virtual characters within the scenario respond appropriately. “You feel the same thing officers feel every day,” Boardman said. 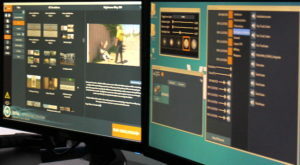 Additionally, trainers, who are situated between two large monitors, have the capability to turn day into night, where a handheld flashlight is needed to see the scenarios. While the simulator can be used for marksmanship training, the real value it offers is exercising the officers’ shoot/don’t shoot split-second decision making. Officers may opt to wear a Threat Fire device that sends a low-grade electrical shock to the trainee should they be struck by a virtual bullet. Before students use the simulator, they will examine historical and current elements of accountability for law enforcement agencies. Once they complete varying scenarios, students will compare and contrast their learning experiences in and out of the classroom.  The conversation will mimic debriefing sessions that officers undergo in the field. “It’s pretty intense when you’re the one standing there,” Bell said.